This is proving to be a well-spaced series of posts, the first in September 2017 (LINK), the second in April 2018 (LINK), and this, the third one in November 2018. Here is an update on the months since my last post. We moved into our apartment in the 6ème Arrondissement of Lyon beginning in late June. Our shipment from the US arrived in early July, but we had some paining done and moved our shipment in early August. The good news was that there were no customs duty or taxes due since we were moving our primary residence (if it were a second home, the duty and taxes could be 50% of the value). The bad news was that an armoire was heavily damaged and about 6 boxes were missing – and not covered by our homeowner’s policy as we had been advised by our agent. Our building is essentially a co-operative, with 9 owners, some descendants of the original builder and owner. Gas and electric hookups were generally easy, with some language issues, especially on the telephone. Our building fees and taxes are under 400 euros per quarter. We needed to buy new appliances for the apartment, since in France, the owners take everything with them when they move (renters usually do, too); and none of our small electrics would work in France, so we needed to replace them as well. We also needed new furniture other than the three armoires, two book cases, one table, and the Steinway piano we had shipped. We had one lamp rewired for 220 current as well. We happened to hit a sale period for most of our furniture and electronics – there are two or three general sales during the year, regulated by the government (to keep small business from severe undercutting by larger retailers). Shopping for furniture here is like in the US, you do your research and look online. We purchased most things in area retail stores and a few online. We ordered two convertible sofas in early August, just before the whole country goes on vacation, so they were not manufactured and delivered until September and October. Cable TV and Internet services are like in the US only cheaper, as is cell phone service. Communications companies are required by law to keep prices low and provide customer service. We ended up with cell phones from one provider and cable TV and internet from another. The new apartment has a cave, or basement, with a dirt floor. It is perfect for storing wine. Our building was built in 1847 and is a block from the Rhône River. There are 5 wine shops (also called caves) in our neighborhood, so the basement cave will be filling up in due order. Our long stay visa renewal mentioned in Part 2 ran into a snag in June. You renew your visas through a different agency than the one to which you initially apply through an embassy or consulate in your home nation. In Lyon, which is located in the Rhône-Alps Department (or state), that is at the Prefecture in Lyon. Appointments take about 3 months to obtain. When we went for our renewal, using a list of necessary paperwork from the OFII website (Office Français de l’Immigration et de l’Intégration), we were told the list on the website was incorrect and we were given another list and told to make a new appointment. That was on June 28th. Our visas were to expire on July 12th and the next appointment available was in October. So, we contacted an immigration attorney (advocat), who told us that the OFII official had illegally returned all of our application items and that our visas would remain in effect until our October appointment. He sent them a letter to this effect, which we took with us when we left the country and had no trouble returning during this period. Then, on October 18th, we returned to the Prefecture and handed in all the correct paperwork (LINK) and were given our extension good through December 2019. Champagne followed. Now, we are legal for another year. After doing this for five years, we will be eligible to apply for permanent residence (like a Green Card) or French citizenship. The current wait for French citizenship applications to be processed is 2½ years, mostly due to an increase in applications from UK citizens due to Brexit. Learning French is still a slow-go, in part because it’s a difficult language and in part because we have been back and forth to America so often. We are planning to be in France more during the coming year and to focus on learning the language better. Meanwhile, the wine is still wonderful, abundant, and relatively cheap; the food is still glorious; and France is, well, France. I am again forgoing Beaujolais Nouveau this year, opting instead for some lush Côte-du-Rhônes and maybe a cru Beaujolais or two. Our first Lyon Christmas is approaching, including the famed Fete des Lumieres (LINK), plus a December trip to Paris. For our first New Years Eve, we will celebrate with friends in Mâcon with what they call Champagne-a-Go-Go, which apparently means large quantities of Champagne. We will be staying over. As always, your comments are welcomed, as are any good tips for expats. NOTE: I will be covering a very interesting wine conference in Portugal in June. 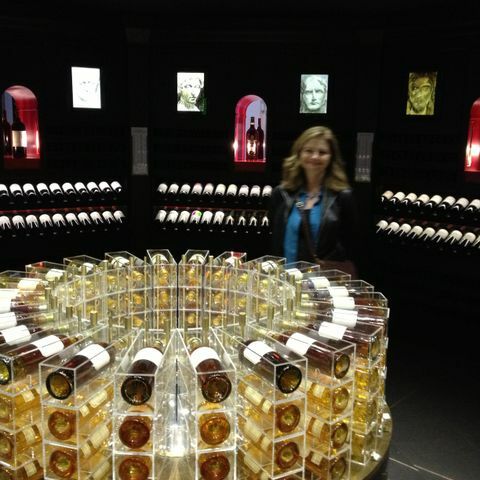 The MUST Wine Summit: Fermenting Ideas (LINK). If you can’t go, you can see my posts about it coming in late June! HAPPY HOLIDAYS TO MY WINE-LOVING FRIENDS! May your Holiday Season be filled with Joy, Love, and Great Wine! 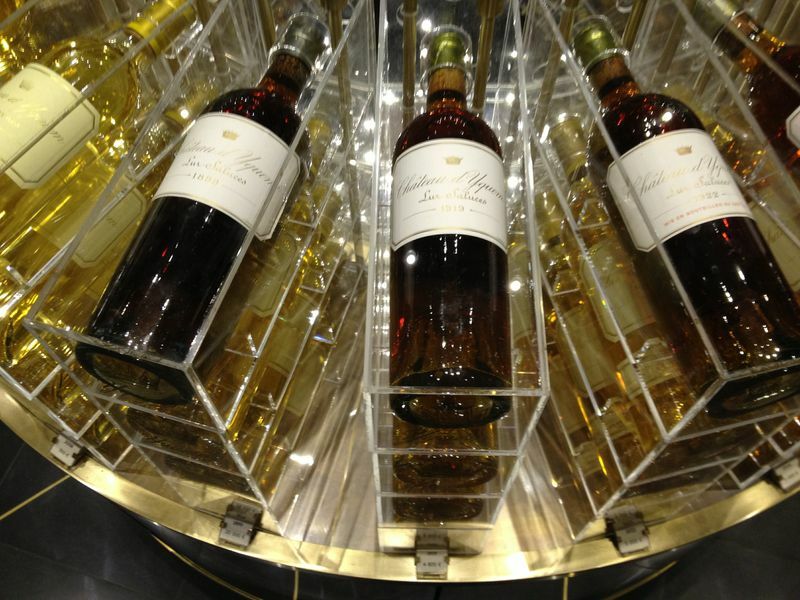 Here are photos of the Chatequ d’Yquem display at Galeries Lafayette Haussmann Grand Magasin in Paris. 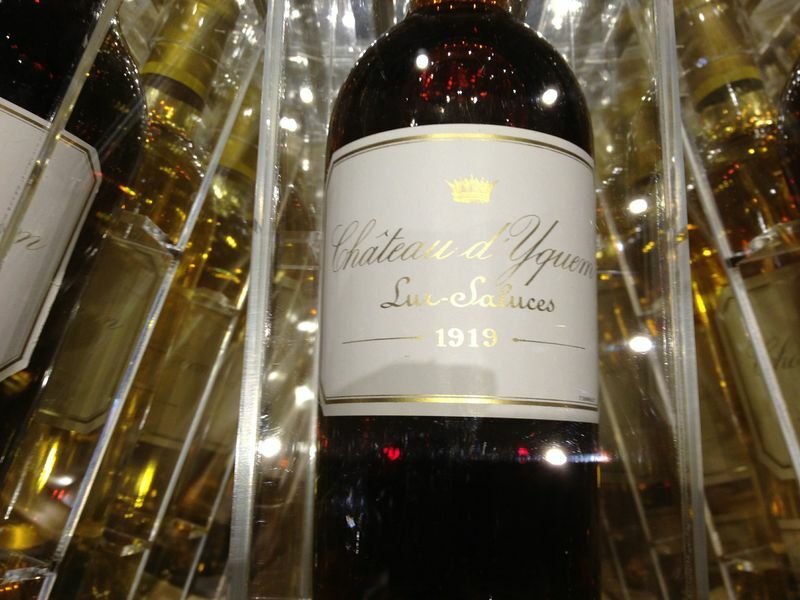 Some bottles priced at 6500 Euros. My personal Christmas wish list!